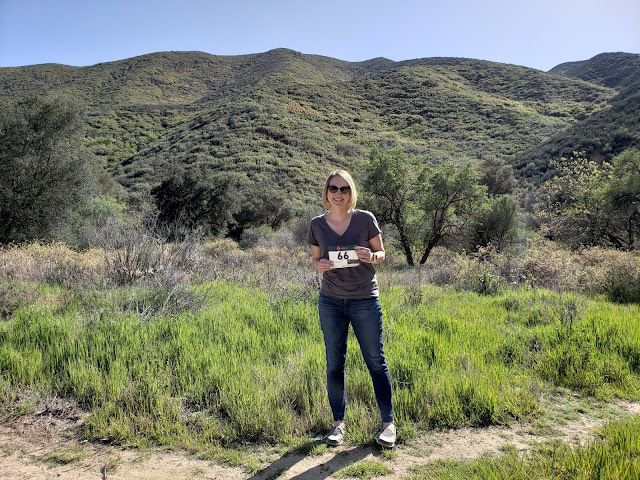 It's been a long time since I've done a currently loving post, and I have a few new items to share from shoes to hydration to clothing. New running gear is my favorite! Disclaimer: All thoughts and opinions are my own, and I was not compensated to write this post in any way. I have actually found shoes that seem to be working for me after trying what feels like everything on the market. Shocking, I agree. Enter the new Hoka One One Clifton, a very light but cushioned road shoe that launched a few months ago. I tried them on at the SF Marathon expo and fell in love. So far I've taken them up to a 15 mile long run with no issues, and I'm hoping they'll be my NYC Marathon shoe. I love the Clifton because they give me cushion without weight, and they still seem to be supportive. They are wide enough for me to wear a normal women's width, likely because they upper is soft and forms to the foot well. They come in 3 fun colors, of which I now own two so I can rotate them. 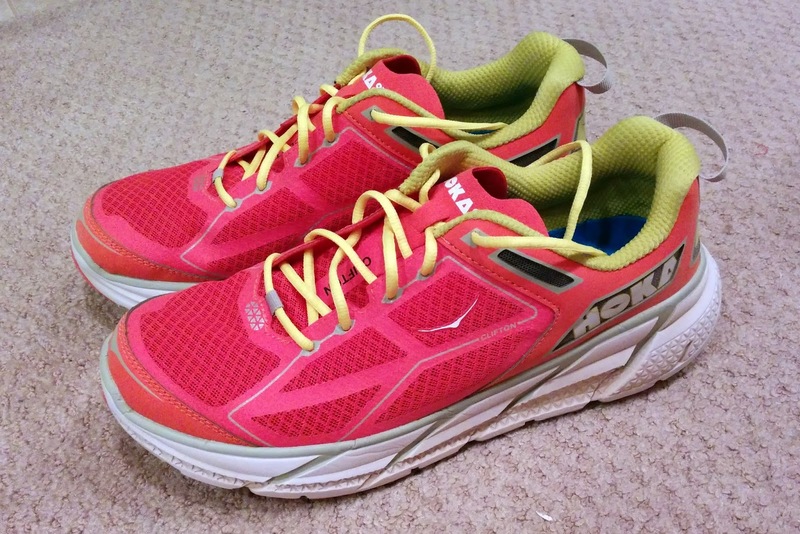 The sole is thicker than standard running shoes, as is customary with Hoka, but I find the sole to be much more 'normal' feeling than other Hokas I've worn like the Bondi 3 or the Kailua Trail. If you are curious, I'd highly recommend trying them out. My favorite Clifton color, bright coral. 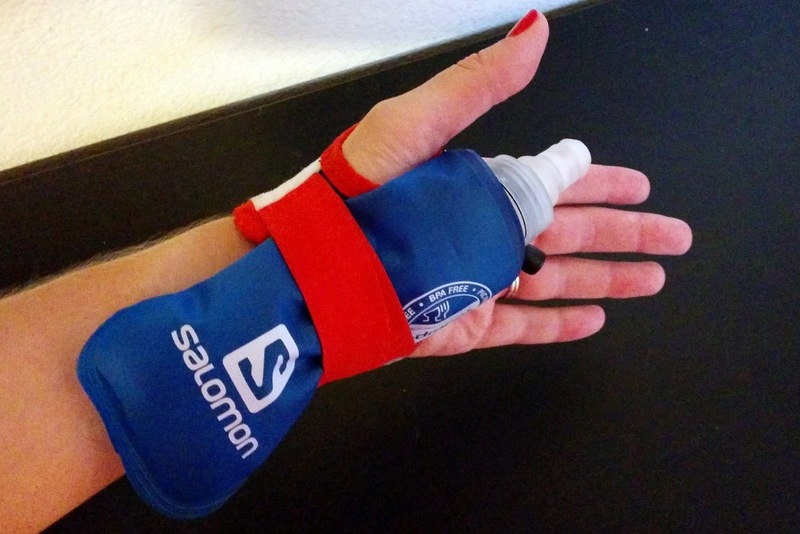 Even if you think you hate all hand bottles, this one might be worth another look. 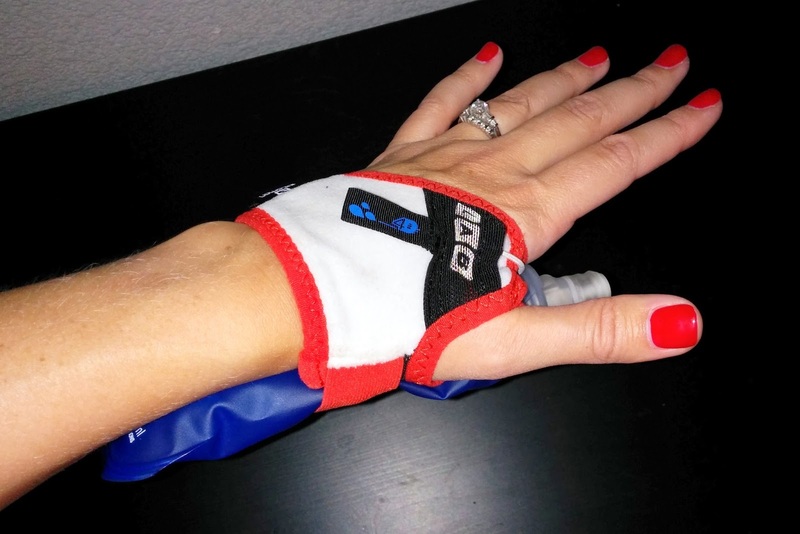 The soft flasks come in many sizes and fit into a unique hand 'glove' that lets you carry the flask without needing to grip at all. I have the standard size set that comes with the 1250ml flask; it sounds small but has been sufficient in many cases. It enables me to carry water for miles in between refill stops and is great for carrying some water on hot days. (That said, if I'm going out on the trail for a long run without available water refills, I take the full on hydration pack instead.) I expected to replace the flask with a larger one and never found the need. 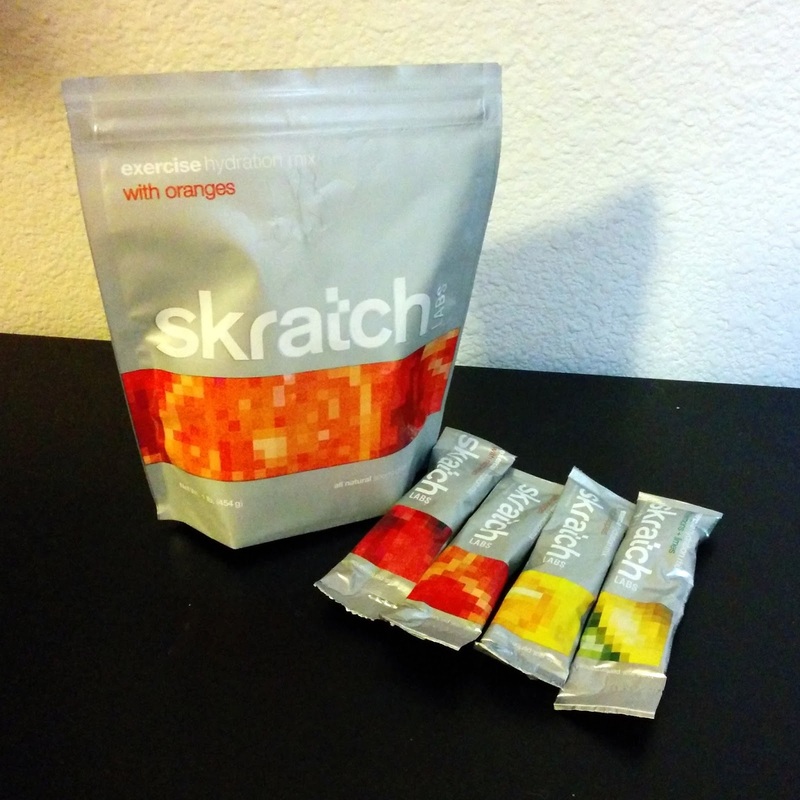 While crewing for Matt at Western States, I discovered Scratch Labs for hydration and immediately loved it. It has a light but good flavor and comes in a few varieties, my favorites being Orange and Raspberry. It's a powder to mix into 16 ounces of water and it goes into solution easily. Scratch isn't carbonated at all, which my stomach seems to prefer during workouts. I also use and enjoy Nuun, but I find Nuun to be a good during-the-day drink as opposed to a during-a-workout drink. Large packet for home, single servings for travel. The Verrazano bra is the new version of the Strappy bra, and I find it to be a fantastic update. The strap location feels better, I like using the removable cups, and the overall fit just feels more right to me. I needed to replace bras and had been waiting to find one I loved; finally, this is it! There are four fabric variations: scantron, chevrona, standard, and charcoal. Charcoal is more compressive and too tight to me, but many ladies love the extra support. The other three versions are similar to one another in level of compression but vary in color offerings and texture. Things to note: I'm small busted and don't need a ton of support, but many friends who are better endowed than me still love this bra (especially the charcoal version). The idea is that having two straps balances the weight without causing pain points. I'm also long on the shoulder-to-under-bust measurement, meaning bras don't always hit properly below the bust, but the Verrazano styles fit me. These flats aren't running gear, but they keep my feet happy when I'm not running. I find most flats to be uncomfortable, toe-pinching, and heel-blistering. The Jing Jing causes none of those issue for me. It uses the Vivobarefoot running shoe platform and is shaped like a foot to give the toes space. The heels have never caused blisters even when the shoes were brand new, and the barefoot sole is comfortable for walking around campus at work or for a day in the city. They have a flat, barefoot-like sole and no specific arch support, but somehow they still feel supportive. Even better, they aren't too expensive at a retail price of $70 (I found all of mine at better prices than retail at Zappos.com) and they come in a variety of colors. Vivobarefoot Jing Jing in Black. Please ignore my sock tan line. Your turn! What gear are you excited about right now? I still haven't tried Hoka's, but I definitely want to. I've never heard of those black flats, but I always need a comfortable pair...especially for traveling. Thanks for the recommendations! Yes, good flats are so important. You are welcome! Thanks for reviewing the verrazano! I've been on the fence about getting it because I prefer the aesthetic look of the strappy, but I'd be willing to give it a try after reading about the fit. I love the strappy, but the fit isn't perfect for me. I truly do think the Verrazano fits differently, hopefully I'm not crazy. :) I didn't like the strappy quite as much. I especially recommend the scantron fabric! Do you have a hydration pack that you love? I am just starting to research them and am so overwhelmed! I do, I use the Ultraspire Surge pack. I've had it for a couple of years and had no problems with it! I love my strappy bras and I'm dying to try out the Verazzano. I love the new neon color! I'm a small chested gal too and the strappy just feels perfect for me so I'm hoping I love the Verazzano just as much. Thanks so much for the flats recommendation, Paulette! I can't tell you how many pair of black flats I've gone through, trying to find a least one or two pair that I can live and walk in at work during the day; I'm definitely going to check these out! Hope you're doing well, and congrats on another Ragnar relay! Woo hoo! Oooh...so much here that I want to try - the Hokas, the Saloman thing and the Skratch stuff in particular! I'm in the market for second pair of shoes! SO lovely to meet you at the weekend. How weird to meet someone you kind of feel you already know but you don't. Interwebs, eh? Looking forward to running with you soon, I hope.